President Rivlin met with Putin on Wednesday, outlining Israel's concerns as Russia prepares to remove its forces from Syria. 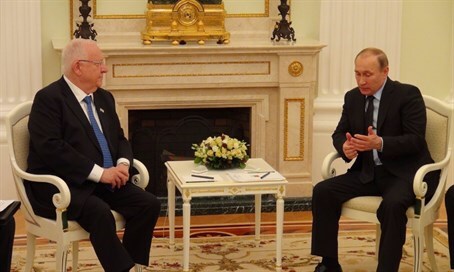 Israeli President Reuven Rivlin met with his Russian counterpart Vladimir Putin in Moscow on Wednesday ahead of a planned Russian withdrawal from Syria. Rivlin conveyed to the Russian leader Israel’s concerns about Iranian activity in Syria, and the active role the Hezbollah terror group has assumed in the Syrian civil war. The Israeli leader also touched on the future status of the Golan Heights, which Syria continues to claim as sovereign territory, despite Israel’s annexation of the area in 1981. Rivlin reportedly told Putin that borders of both Syria and Iraq were arbitrarily drawn during the First World War, and did not reflect present realities. Rivlin even suggested that the borders of both countries be altered, suggesting support not only for recognition of Israel’s annexation of the Golan, but possibly the partition of both Iraq and Syria. The Israeli President emphasized Israel’s concerns, laying out the country’s red lines vis-à-vis Syria. Israel would not accept, Rivlin told Putin, the presence of Iranian armed forces near the Golan Heights. Rivlin expressed hope that the United Nations peacekeeping force separating Israel and Syria would return, restoring the buffer between the two countries that has been absent since 2013. Rivlin also noted that the future of the Golan Heights was non-negotiable, and that the area must remain under Israeli control.